The Allen Brain Observatory presents its inaugural dataset, allowing for quantitative exploration of the functional properties that underlie coding of sensory stimuli through the visual pathway, at both the single-cell and population level. The characterization of visually evoked cellular responses is carried out using in vivo calcium imaging from GCaMP6-expressing neurons measured from selected brain areas, cortical layers, and Cre lines. The activated calcium responses that are quantitated during the presentation of natural scenes provide data to help characterize individual cellular and cell population responses to complex visual stimuli in the visual cortex. To examine the cellular responses to natural stimuli, a library of 118 natural scenes was used, selected from three different databases (Berkeley Segmentation Dataset, van Hateren Natural Image Dataset and McGill Calibrated Colour Image Database). 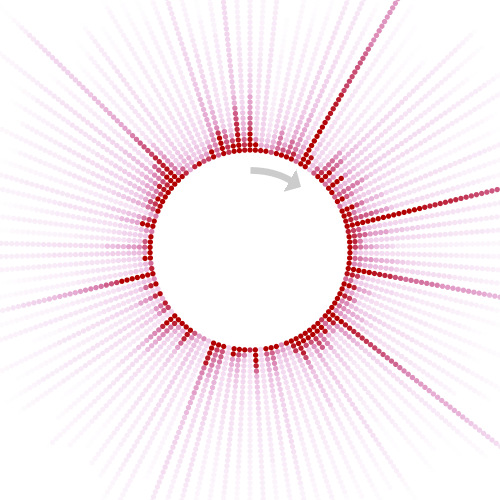 A scene image was presented briefly (250 ms) then replaced with the next scene image. Each image was presented 50 times, in a random order, with intermittent blank intervals. Data gathered from each image are represented along a ray extending from the center circle in the "Corona" plot. The cellular response to each image presentation is represented by a single dot, where the color corresponds to the intensity of the response. Dots are arranged with the strongest response positioned at the core, with lower intensity responses radiating away from the center. This representation allows viewers to easily determine which images elicited the greatest cellular response, and reveals cells that have particularly selective responses in comparison to cells that respond broadly to the presentation of a variety of images.